Image size: 26"w x 15 1/2"h.
Image size: 35"w x 21"h.
Image size: 47"w x 28"h.
Fueled by hope, optimism and necessity, pioneers began to push beyond the Mississippi in earnest by the mid-1800s. Some of these emigrants went west in search of land, some in search of gold & silver and some, for religious freedom. 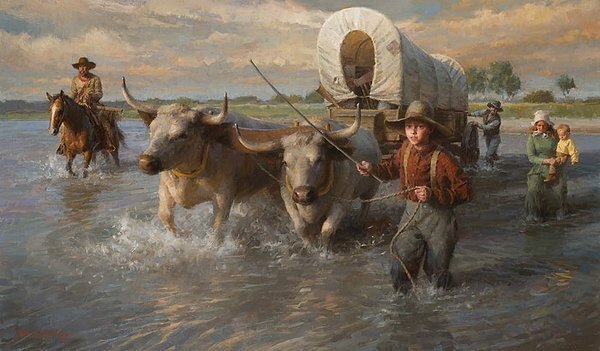 Weistling’s paintings of pioneer history capture the heart and soul of the frontier experience because he opens himself up to the unique human experiences and details what he observes while researching his work. Is it a source of pride for you that your ancestors braved the uncertainties and perils of the trails westward to achieve freedom and prosperity for themselves and future generations? Honor that rich legacy with a Fine Art Edition of Morgan Weistling’s "Crossing the Cheyenne River, Summer, 1850."